This is one of those DIY crafts that I pinned on Pinterest ages ago! Every time I saw it I'd say, "I've got to try that! It looks so simple!" Being that I'm not the most crafty person, I gravitate to the easier projects! This project is making a holder for your phone while it's charging. The pin led me to Make It and Love It where the author, Ashley, came up with an awesome, simple idea to avoid this mess when there is no table nearby to set your phone while it's charging. This project was even better because I had everything on hand already! I used spray paint for my project but Ashley used fabric and mod podge which is super cute but I wanted a quicker, simpler way to dress mine up! Feel free to check out the original blog post HERE where you can find great instructions for how to mod podge fabric onto your phone holder! If you come up with new ideas for decorating it, show 'em off! I wanna hear your ideas and see your cool results! Mod podge and girly glitter, anyone? First, find a bottle that is big enough to fit your phone inside. For me that was an empty Organic Fiji lotion bottle. It's the tangerine lemongrass scent...the best!! **Side note: I LOVE this lotion...it's made with coconut oil and other natural ingredients so it actually soaks into your skin and doesn't leave you feeling greasy! I use it every day...even on my hair as a styling product! It alleviates the frizzies and doesn't leave my hair oily or greasy at all! ** Ashley, and I both recommend finding a bottle that is flat instead of rounded because then it rests against the wall better and stays out of the way. Also, pick a larger/taller bottle than this. You'll see why later. AMERICA! I'm all about made in the USA products! I love this country! Next, decide what size you want the holder to be and draw a line across the front. This was probably the most frustrating part because it took way too long to find a pen that would write on the bottle! Then, on the back, curve the line upwards and around. Be sure to leave enough space that you can cut out an outlet-sized hole. This is where the phone will hook over the part of the charger that's plugged in. Draw a rounded square slightly large than the size of an outlet in the middle of the taller section. Once you've done that, cut along the lines. I used scissors but whatever is easier for you, go for it. After you cut it, the bottle should look somewhat like this. The next step is where I switched to an exacto knife. Cut out the rounded square on the back. Take your time! And start small in case you need to round it more and fix little errors. This is how it looked before I cleaned it up a bit. Ok, ok, I know that square is pretty lopsided...don't judge me! Once I trimmed and cleaned up any edges that looked funny, I took it outside and spray painted it! I used blue, green, and yellow and gave it an ombre-esque look to it. Apparently it's all the rage in nail painting these days! I see it all over Pinterest! Whoops, somehow I got too excited and forgot to take a picture after I sprayed the green! I probably should have sprayed a flat black or something first to cover the label. Guess I'll just have to spray paint more layers to cover it! And here's the finished product! Why is it upside down, you ask? SIZE ISSUE! I realized a bit late in the game that it wouldn't sit low enough if the phone is sitting upright. Back to the drawing board! Or in my case, grab something sharp and get to it. First I cut the front lower but then I decided to cut a hole in the bottom and just plug the phone in from underneath. Problem solved! I didn't include a picture of the plug hole because, frankly, it was an ugly cut. The plastic was really thick so it was impossible to be precise. But no one will see the bottom so who cares! There ya go! Definitely not as cute and perfect as the original blog post but I think it's cute and it's definitely functional! Do you think you'll try this project? What would you do differently? P.S. Follow me on Pinterest! I try my best to actually DO the things I pin and I even have a pin board for the things I've tried, whether they've succeeded or failed! And even pins like this that were semi-fails. Follow my pins and keep me motivated to keep trying new things! P.P.S. Be sure to check out the following link parties and the AWESOME bloggers who hosted them! I've linked up to Less Laundry, More Linking #6 with Life After Laundry and Sensational Creations! 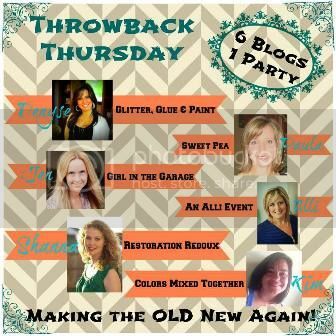 I've linked up to Throwback Thursday #2 with Glitter, Glue and Paint, Girl in the Garage, Sweet Pea, Restoration Redoux, An Alli Event, and Colors Mixed Together along with their special co-host, Deja Vu Designs. I'm sorry but, I disagree with you... you ARE a crafty person :) I love the way you spray painted it. And yes, I will probably try this but I think I wouldn't change anything. Maybe, instead of spray paint, I would use washi tape (I'm obsessed with that tape) Lol. Thanks for sharing this great DIY at the Less Laundry, More Linking party. Aww you're so sweet! Thank you! The ombre craze inspired how I painted it! My main advice is make sure your bottle is extra big! Thanks for hosting! That's a cute idea. I've seen it floating around Pinterest but never tackled it myself. You have proven it useful. Thanks for linking up to Throwback Thursday! Thanks! It's really nice to have when traveling! Thanks for hosting! I love this idea. And, the ombre makes it so fashionable. How can you think like that .....Simply love it . God bless you and post many more thinks.